This is another collaboration post, with guest writer Mardi( from Luminosity)! Since she was the one to introduce me to Dia, I thought it would be a good idea to ask her thoughts of her favorite under rated. Mardi’s part is in green and my part is in black. 하루종일 비가 내있어 (It Rained All Day) starts off the album with a melancholy mood. This really shows that she has control of her voice and how much she’s grown as a singer. Songs like this are totally made for her voice. Love it! “It Rained All Day” is the perfect example of how much Dia has matured as a singer. During an ArirangTV interview in the start of this year, she mentioned the reason for the usage of “carat” in her single albums. 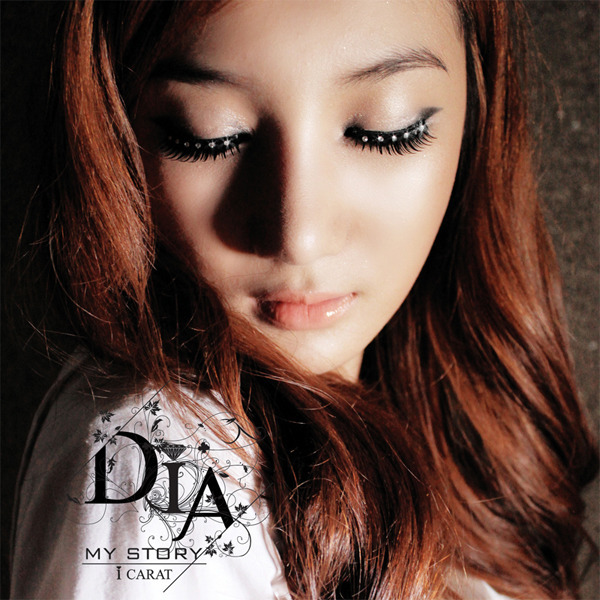 Her debut mini album was “0 carat” and a year after, she released “0.5 carat” and if you notice, this full album is titled “1 carat.” It refers to the fact that she is becoming a ‘stronger’ gem. The name Dia is short for “Diamond,” thus she has to become more and more valuable. I think we can all agree to how strong and beautiful this song is. I always thought that her voice is a bit overpowering but I have to say, this song suits her well. The simple piano medley with her controlled and matured vocal is carried out nicely. 온세상에 눈이 내리면 (Feat. Soul Connection, 구자창(Dr.9) is a fun Christmas track. Soul Connection rapper lends his smooth rap. Dr. 9’s is a nice contrast from Dia’s soprano notes. This song makes me feel so happy:) This Christmasy track is one of the three title tracks off the album. Dia exerts a fluffy and cute feel with her softer vocals while Soul Connection Crispi Crunch’s rap flows smoothly. In this song, Dia doesn’t overshadow the rap and Dr. 9’s deep but calming voice. This is the first time she has had a ‘known’ featured artist in her album and to me, it marks another step further into her music career. A-mi’s voice scared me when I first listened to 사랑이 오려나봐요 (feat. 아미); it’s really deep. This also has the Christmas fee like the previous song. A-mi’s rap is also quite cheerful. For another Christmas themed track, Dia teams up again with A-mi for an upbeat track. This song shows yet again her softer and cheery side compared to her usual slow and emotional ballads. However, at the same time, you can hear that hint of longing and loving side for the one she loves. A-mi lends his dorky personality rap and creates a jolly atmosphere. 니가 돌아오면 (You Came Back) is way too short. I really like this and it reminds me of a Christian song that I listen to often; very uplifting and it has my favorite instrument: piano! I hate that this is so short and I don’t like how it ends; kind of rushed.“You Came Back” is a short song that is like an excerpt of what is ‘more to come.’ If it was the length of a normal song, it wouldn’t fit well as I think it’s more of a quick peek of her musical style. Although I do feel it somewhat has a feel of ‘abruptness,’ I love it when she hits the high notes. 울어도 울어도 (Cry Cry) is a ballad that you can really feel the emotion in and that’s pretty difficult. I like that she isn’t screaming all over the place like a lot of singers feel the need to do when singing a ballad.“Cry Cry” is one of those songs I think sounds better when executed live. It probably is just a personal preference, but I love seeing that raw emotional feeling on stage. Even as I’m writing this review, I am watching it live. “Cry Cry” is one of my favorite songs that Dia has released. I absolutely love the soft violin tune and think that she has that ability to exert the song to its fullest potential. I fell in love with Slowly Feel My Eyes on her single 울어도 울어도. This song reminds me of what might be heard on a show like Musicl Travel Lalala. It has an acoustic sound with just a guitar.This gentle and charming song has such a lighthearted feel. I really love the guitar work and is what makes the song have such a soft sensation to it. I really love the simpleness of 바보처럼 좋아해 (Foolish Like). It’s just a piano, bass and Dia. I also like how she drags out the last note in love. “Foolish Like” is a mix of a blissful and mystifying sentiment. Like all the songs before and after this song, I think her voice is a bit strident, but at the same time, she hits low notes that makes the song balance a bit out. Another Boy totally got Dia some attention, although it was for the Park Bom(2NE1) comparisons, nevertheless she still got pretty popular with this song. I hate the fact that she didn’t get to promote that long because I think if she did, then people would’ve warmed up to her and really listen to her music.THE song that has to be talked about when it comes to Dia’s music. To me, I feel this is the turning point of her musical career. “Another Boy” is those types of songs that had the potential to make it far, but unfortunately didn’t. Probably due to all the Park Bom comparisons and coming from a smaller management, the song received mixed reviews but I have to say, it’s one of her best songs and I wish it was promoted more. It really showed that a song can be catchy and yet still is able to illustrate the solid clear vocal. It probably is also just “another Kpop song” but most definitely, it showed Dia’s different color and I quite enjoyed it. 이젠안녕 (Goodbye) is one of the few songs that has made me shed a tear. This was to honor the Cheonan victims earlier this year. You can literally feel all the pain and sadness when she sings. Definitely heart touching song. This has to be Dia’s most touching and tearjerking ballad that makes me literally have a meltdown. This song was written by Dia herself to commerate the Cheonan victims earlier this year. Initially, it was just something she wrote for them, but turned out to be released as a digital single due to the popular response from netizens. The song talks about letting go of someone you love so much and I think Dia nailed the song. When listening, you can most definitely hear that feeling of pain and yearning from the bottom of her heart and it just makes it very heartwrenching. I don’t know if anyone could pull off that genuine emotion that Dia is able to prove in this song. 사랑에 미쳐서 (Crazy In Love) is pretty upbeat, but I feel like it might be the total oppisite especially since she’s saying ‘it hurts’. I think if I watched this live, then that would make a big difference. I like the song, but not something that I have on repeat. One of the songs Dia has promoted often, “Crazy In Love” is one of the songs that I cannot stop singing to. Whether the song is meant to be sad or not, I don’t necessarily feel that dash of sorrow. When she performs the song live, she does this hand movement where she takes her fist and “jabs” it towards her chest. I’m assuming it somewhat represents the pain one is in when in love and I feel it adds a little spark to the song. Knock (ft. H-Eugene) is a more pop/dance song from her featuring rapper H-Eugene. I like the use of autotune in this song because it’s still tasteful and not overkill. “Knock” is the track, along with “Another Boy” that I would like to call “mainstream/idol” worthy. It has the catchy tune and lyrics along with the lovely rap by H-Eugene. However, it still didn’t receive a lot of attention but that usually happens to underrateds so it doesn’t come as a surprise. In “Knock,” you can hear that slight use of autotune and even the live performances were pretty good to watch. It not only showed her more feminine side but she incorporated more dance. D. Bridge (Feat. The Black)is something different from her. It has a more synth pop sound. I surprisingly liked this more than I thought.“D. Bridge” is one of the tracks that was unexpected, at least for me. However, I love it. It’s one of those tracks you don’t think to listen to again and again. It contains a lot of background beats and rhythms that you typically see in your normal Kpop tracks. With Dia’s unique voice and The Black’s brief rap featuring, the song is quite decent. I enjoyed listening to Dia’s first full length album. It was fun, it had attitude, showed off her voice and how far she has progressed. I’m a little disappointed that there weren’t that many new songs on the album, but I guess two are better than none. I recommend listening to everything this girl has released because she is really talented. I rate this album 5/5. Overall, I have to say I was very excited to hear Dia was coming out with a first and full album. It really marks the point in her career where it shows us she has matured and am growing well as an artist. Even though she might not be “idol” material, she has so much more to offer as a person. I really would love to see her continue to grow not only as an artist but as a simple being. The only disappointing things about this album was the fact that there were no additions of her songs from the first single. Not a lot of people are aware of Dia and her music, so if they were to hear her debut song “My Dream,” they would be able to see how well she can fit almost any genre. “My Dream” has that pop jazzy feel that really was out there and was a bold move as a debut track. Furthermore, I wanted more new songs but as you can see, she has released a fair amount of new songs this year so that doesn’t really matter if you look at them all. Whether a fan of Dia or not, I’m sure you’ll find a couple of songs you’ll come to enjoy. I hope to see much continuing support for her as she is a talent, like many others, that shouldn’t be left unnoticed. Omg, thank you so much for the review! I’ve listen to it and I love each song, and just still surprise about her vocals ability. but with what all you both have written, makes me want to go back and listen to each song and just listen to it. Dia is definitely a talented girl and needs more recognition. and i’m loving the fact that she has grown with each song and releases, and i hope that it continues and i can’t wait for more. thank you so much for sharing!